Oberon Games is arguably one of the best developers of the classic seek and find puzzle games, in which players must find cleverly hidden objects scattered about a particular area. 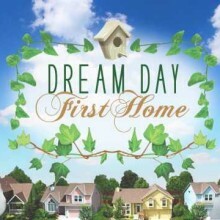 The first one I looked at from them was an Agatha Christie themed seek and find, and now the company’s newest title is Dream Day First Home, the third title in the Dream Day series. Offering up an extremely lengthy gameplay experience and some new features one might not expect, this is arguably one of Oberon’s best games yet. I know what you’re probably thinking right now. More likely than not, it’s something along the lines of “How can a game themed around a couple getting their first house be a challenging seek and find compared to the likes of an Agatha Christie title?” And this would certainly be an appropriate question to ask, but give this game a chance. You see, not only does Dream Day Offer two separate homes to explore with over 50 levels and 36 different backgrounds, but just about every room is packed to the brim with various items. If you thought it was hard to find objects in other games of this type, wait until you get to some of the later levels in Dream Day. The game even throws in objects that can only be found by touching other objects (ex. you can only get a CD by first touching the CD player to open it), which help add to the challenge. As if this weren’t enough, the developers also decided to throw numerous minigames into Dream Day First Home. These range from matching games that include memorizing and object association to one that has the player spinning reels to create new and unique furniture. Though all of the minigames range from about 1-2 minutes in length, they help to break up the pace of the game and entice players to keep moving forward for longer periods of time than they would otherwise. Dream Day First Home is extremely appealing graphically, and it is simply amazing just how much junk Oberon was able to fit onto every screen (as some of the objects one has to find are deviously hidden). It’s also nice that the developers integrated a storyline in and made the level selection screen look like a photo album. Little touches like this really help to add an extra layer of polish to the game. As for the sound, the background music is light but ultimately becomes repetitive and will likely leave your brain as soon as you’ve closed out of the game. However, as with most seek and find titles sound is not overly important as players will be focused on the objects they need to find. Don’t be fooled by the theme of this particular seek and find game, as this one has some of the most cleverly hidden objects and offers more items on screen at one time than any other offering out there. In addition to this, the minigames help to break things up in a genre that can admittedly get a bit repetitive during long play sessions. I wasn’t expecting to like Dream Day First Home more than the Agatha Christie seek and find that Oberon presented earlier, but this ended up being an extremely present and very addicting surprise.